It’s a foundation for a wearable platform. It’s a Nato watch strap threaded through a PCB with a coin cell battery holder between the PCB and the strap. I’m using a Attiny85 this time around but could be used for most chips/dev boards. This is a proof of concept to iron out any problems I’ve overlooked. Project info at Facelesstech’s blog and the GitHub repository here. This entry was posted on Monday, April 30th, 2018 at 11:47 pm	and is filed under AVR, DIY. You can follow any responses to this entry through the RSS 2.0 feed. You can skip to the end and leave a response. Pinging is currently not allowed. An 8-pin MCU has too few I/O lines to be useful for anything but discrete LEDs. Using discrete LEDs to show the time in binary format gets old fast. A 14- or 20-pin SMD is better. I would throw away the resistors, just PWM the thing. At 3V the pins can’t drive much anyway and current will saturate at a safe level. For programming, one can also hide a micro USB socket on the underside. It would be the most convenient and reliable option to load code or data. With some care, it may also be possible to change the battery to LIR2032 and use the micro USB socket to recharge. * not a contradiction with the fist sentence; probabilities don’t go below zero. Ha ha ha, yeah, I have yet to see anyone (that is, offline, in real life, not just Woz) wear a DIY-type watch. :-) I just stick to a Casio. Zero desire to get a smart watch either. Often cheap chinese imports in dollar stores are interesting, I’ve seen red and blue 7-seg LEDs, uses CR2016/25/32, etc. Never had any urge myself to do a watch project though, only speculative design and parts browsing. E.g. while I claim to like HP QDSP-6064, I haven’t gotten around to buying any, ha ha. 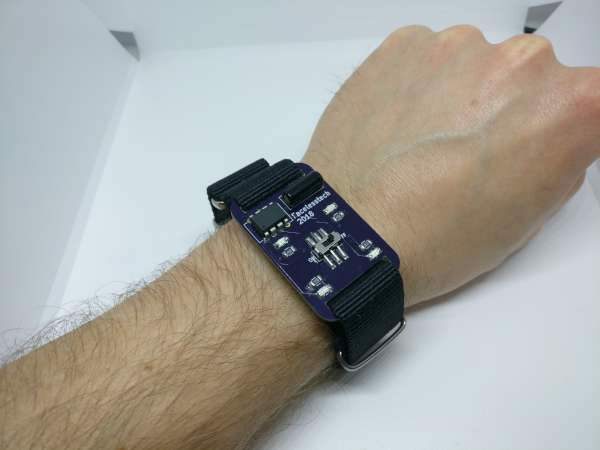 For a respectable-looking DIY watch, I just checked, TI’s eZ430-Chronos is still on sale at Element14.